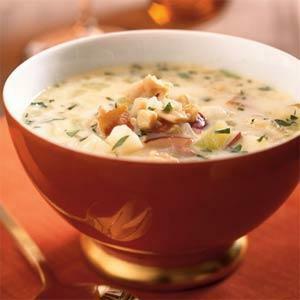 In honor of the end of Daylight Savings Time (or “Fall Back”), a glorious sunny, crispy Fall day, the change of seasons and my love of cooking, I wanted to share this amazing chowder recipe. I have a few notes/tips having made this a few times. When I lived in a secured apartment building (meaning, my front door opened onto a hallway rather than the outside world) I would open my door – and my slider facing the waterfront canal – to get some additional ventilation and often had neighbors wandering down the hall asking what was for dinner! Salt and black papper to taste. In a large stockpot, cook diced bacon until crisp. (I use a Calphalon 6 1/2 quart stock pot – perfect size for this or an 8 quart is great as well). Add oil and heat. Add onion, fennel and garlic. Saute until tender, about 2 minutes. Add flour and stir while cooking for about 1 minute. Slowly add the chicken stock, whisking constantly to avoid lumps. Add diced potatoes and cook until barely tender. Add corn and cream and bring to a boil. Season with cayenne sauce, salt and pepper. Serve hot. NOTES: I prefer to cook the bacon in a separate, small fry pan so I don’t have bacon grease in the stockpot with the rest of the chowder. I cook the bacon till it’s barely done and then transfer with a slotted spoon to the large stockpot with the onion, garlic and fennel. If you are using frozen corn add it in very last minute so it doesn’t get too tough. Serve hot! This soup is a MEAL with corn bread or sourdough bread.